"We truly believe that everyone should live beautifully...not just aesthetically but in all aspects of life." This is the maxim of Nile Johnson, the Philadelphia-based interior designer, and principal of Nile Johnson Interior Design. Johnson, whose office is in historic Kennett Square, is inspired by his surrounding environment. A trip to a local coffee shop, a visit to a favorite bookstore. All of those elements come to form this designer's aesthetic, which is a mix of both modern and traditional elements in the historic homes that he designs. His Fallbrooke project, located in Kennett Square, brings together elements of old-school glamour with contemporary features, to form a traditional space with colorful details. One of the most beautiful features in this home is an antique wood hutch. The ornately designed piece is a staple in most Philadelphia homes. For many, a hutch, fit for storing away favorite pieces of china, is a family heirloom that is passed down from generation to generation. And this piece certainly has a story to tell. It's clear that for Johnson, who studied both interior design and architecture, this piece was a focal point in the design of the home's dining room. 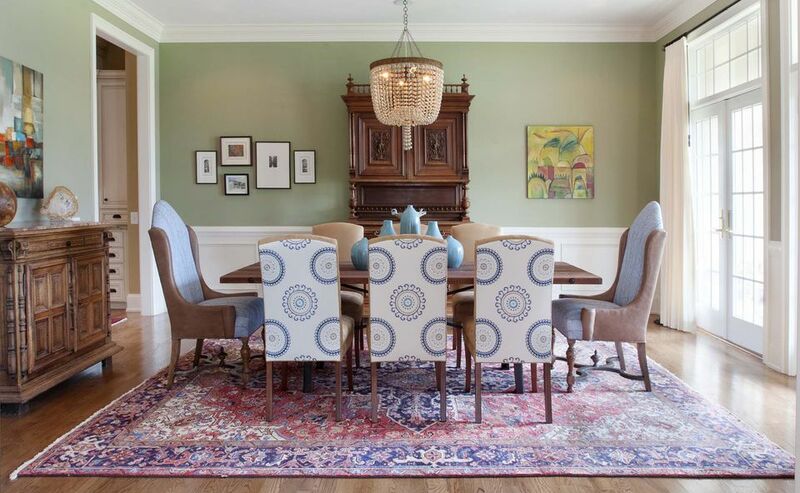 The dining room in this suburban Philadelphia home has a beautiful color palette. Shades of green add a fresh touch to the walls. Johnson has added to the woodgrain in the room with a beautifully made dining table, featuring combinations dark and medium-toned natural hardwood. On the table sits a collection of blue ceramic vases. The color is a perfect complement to the dining room seating, where hints of the shade play out on the suzani-upholstered chairs. 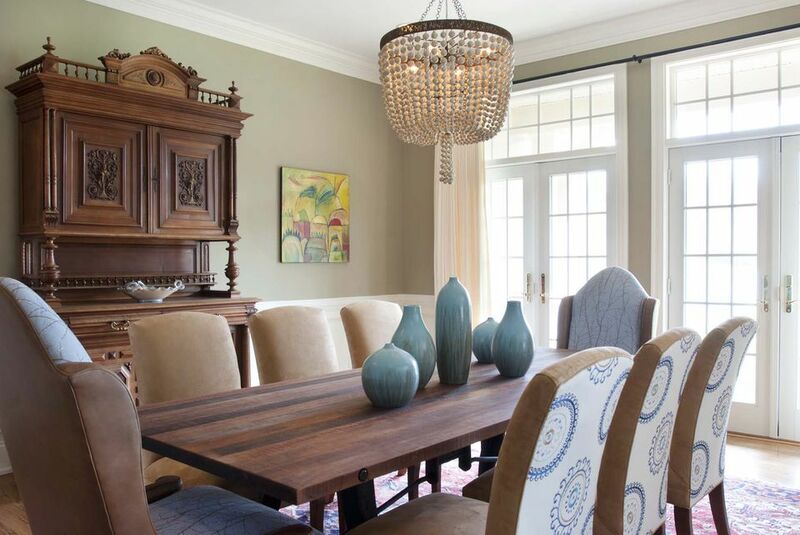 Over the dining table, a beaded chandelier adds a neutral touch. Through the dining room, and you get a peek into the home's cozy family room. The walls have been painted a deep shade of navy, a perfect backdrop the interior's more neutral pieces. A beige sofa and crisp white daybed offer a sense of contrast in the space. Drapery in off-white pops against the dark, blue walls. To complete the color palette of deep blue, Johnson has used accessories like art and textiles to great affect. Blue pillows reinforce the room's color palette, while a dark and moody painting becomes a finishing touch in the space. Johnson has a talent for creating beautiful vignettes in an interior. Inside the family room, he's created a space for storage, and an additional seating nook. Anchored by a modern Egg Chair in dark leather, the nook features a stunning console as well. With clean, modern lines and a beautiful wood tone, the piece is a show-stopper. Great for extra storage, or for use as a buffet when entertaining, this console has the ability to do double duty in the family room. Over the console, an arrangement of masks and a modern mirror completes the striking vignette. The living room in this interior is grand, to say the least. Tall ceilings and floor-to-ceiling windows allow light to flood in. Johnson opted for a saturated, cinnamon brown paint color for the walls. The shade allows the light to bounce around the room's tall ceilings. Crowning the space, an iron chandelier accents the height of the room. The furniture in the space also adds to the color palette. A sofa in a spicy shade of cayenne stands out. Grounding the space is a flamestitch rug in a riot of colors, from bright orange to yellow and hints of gray that are reflected in the other living room sofa. Just as Johnson's maxim, the aesthetic of this Kennett Square home is dedicated to living beautifully. Moments have been carved out for comfort and enjoyment. Traditional style has been met with bold modern elements. And the overall space is an interior that a family can comfortably grown into over time. All is reflection of Johnson's desire to design spaces that reflect the beauty of living.